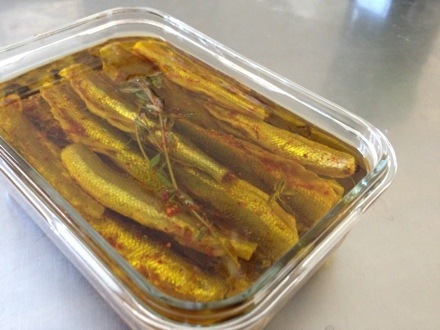 Quick-cured smelt in lemon-orange marinade. Growing up in Ontario, my dad used to come back from wintertime east-coast work trips with a bag of frozen smelt, but I never really understood where they came from (river? ocean? lake?) or why they were so delicious. Imagine my surprise when, driving home this week, I saw a pickup truck in a church parking lot with crudely painted sign advertising TROUT and SMELTS. Moving east has its perks, including this totally delicious oily fish, which are fished in the winter through holes in the ice. It’s a local and sustainable fishery, and comes with none of the horrifying ethical dilemmas posed by tuna, for example. Plus, did I mention that they are delicious? Now, they’re excellent and easy if done the old-fashioned way: breaded (crumbs or panko mixed with a bit of powdered garlic or pimenton and salt) and then deep fried, but you can only do that so many days in a row before it’s old news. Luckily, a dear chef friend recently gave my man and me Preserving Wild Foods, by Matthew Weingarten and Raquel Pelzel. It’s a truly excellent cookbook (and this is coming from someone who would rather make room for a new implement than a new cookbook) and a great resource for anyone who wants to start foraging or preserving (or both!) It also has a neat way of presenting recipes, which integrates measurements and ingredients into the recipe and process itself, but you’ll have to read it for yourself to know what I mean. In it, there’s a totally crazy technique for making garum, an ancient umani condiment favoured by the Romans that is also a handy way way to repurpose smelt innards. (Let’s be fair, the only other use would be to help fill my garbage can.) That is currently fermenting (ie. rotting) on top of my fridge, and I’ll let you know if it works out. 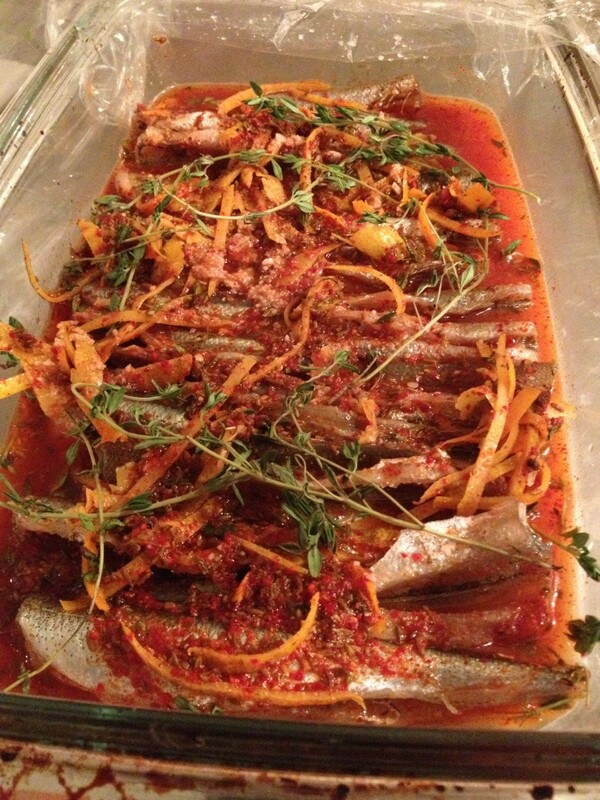 I fell in love with the book’s salted sardines, coriander and thyme process, so I modified the recipe slightly, substituting cumin for coriander, and piment d’esplette for red chili flakes, and appear to have stumbled upon a winner. Plus, because the salting is a preservation method, I’ll be able to snack on them all week. They’re great with bitter greens and epic with a nice Manchego and crackers. 1. Mix the salt and sugar, and spread 1/3 of the mixture on the bottom of a non-reactive pan. Lay the smelt flesh side down on the salt and cover with the remainder. Cover and refrigerate. 2. Meanwhile, mix cumin, zests, juice and piment d’esplette in a small bowl. 3. Once fish are slightly firm and skin is wrinkled (45 minutes to one hour) brush excess salt from the smelt and rinse and dry the pan. Lay down a few sprigs of thyme, dip each smelt in the citrus mixture and then cover with the rest. Refrigerate for 12 to 16 hours. 4. Put 1/4 of a cup of olive oil in a 6-inch long (or so!) glass container and layer with smelt, more oil, then more smelt, more oil (you get the idea) until finishing with a layer of olive oil to cover. Cover tightly and refrigerate overnight. They will keep very well for at least a week, but I assure you that it won’t take you that long to eat them. The final product will keep for at least a week.